A wind energy research lab on North Carolina's coast has become a visitor attraction, according to local residents. NAGS HEAD, N.C. — The steady winds that propelled the Wright brothers’ first airplane flight near here in 1903 – combined with a long, shallow outer continental shelf – help make North Carolina ripe for offshore wind development, with more potential than any other East Coast state. A public meeting hosted by the Obama administration this week at Jennette’s Pier showed most coastal residents ready for the state’s potential to be tapped – at least as long as the wind turbines remain beyond the horizon. But the earliest a hypothetical offshore wind farm could begin producing power for hundreds of thousands of homes is 2025, and advocates say a change in the market and better state policies are crucial to making North Carolina’s offshore wind promise a reality. The Obama administration, which has made renewable energy development on public lands and waters a key feature of its Climate Action Plan, sought this coastal community’s feedback on a 122,000-acre patch of ocean off the Outer Banks that it plans to lease for a wind farm as large as about 1,500 MW as soon as January of next year. Leaders from this string of barrier islands had united to defeat federal plans for Atlantic offshore drilling earlier this year, motivated chiefly by concern for the region’s tourist economy. Now many of these same businesses and elected officials are beginning to support offshore wind, which they view as risk-free, clean alternative to oil and gas development. The Bureau of Ocean and Energy Management has moved its proposed lease area farther out to sea than it originally proposed, hoping to satisfy the town of Kitty Hawk, which opposes wind development within 20 nautical miles of shore, and the National Park Service, which sought to protect the view from the Bodie Island Lighthouse at Cape Hatteras. Not everyone along the coast views wind turbines as an eyesore. “For me, they are beautiful, because I know what they’re doing,” said Ken Jobe of Beaufort, who volunteers with the Citizens Climate Lobby, referring to the carbon-free electricity the turbines produce. Twenty-nine year-old Samantha Hart, a server at Goombays Grille and Raw Bar down the road from the fishing pier, agreed. 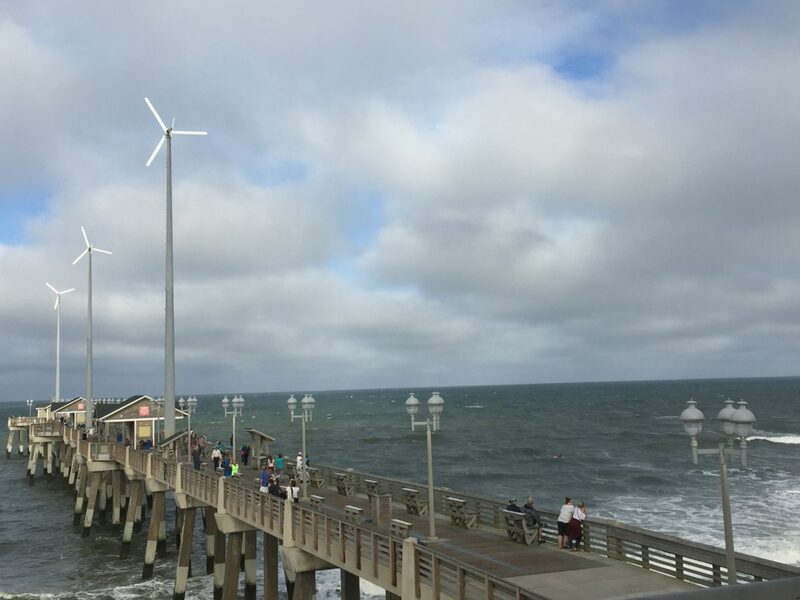 Hart, a Kill Devil Hills resident who grew up on Roanoke Island, said the turbines at the local Outer Banks Brewing Station and Jennette’s Pier – a publicly funded pier that also serves as a research station – had become attractions all their own. There’s little data on how tourists really feel. Some analysts share Hart’s view that wind energy could become an attraction, while a North Carolina State University survey of vacation home renters suggested turbines within view of the beach would lower property rental values. Lee Nettles, executive director of the Outer Banks Visitors Bureau, is mostly withholding judgement until more specifics materialize. Advocates are optimistic that a North Carolina wind farm proposal will emerge for Nettles and others to evaluate, but it’s not a foregone conclusion. With the nation’s first project off Rhode Island’s coast expected to begin delivering power this fall, the U.S. lags far behind Europe in offshore wind, globally about twice as expensive as onshore wind. The Rhode Island project moved forward in part because of unique conditions on that state’s Block Island, which made offshore wind in the community’s economic self-interest. In Maryland, U.S. Wind now holds the lease for a 187-turbine project, the largest currently planned in the country. The $2.5 billion investment was possible in large part because of a state law requiring a certain percentage of the state’s energy to come from offshore wind. BOEM officials say they have streamlined their process to shave about two years off permitting times, and are moving aggressively to work with local communities like those in the Outer Banks to work out potential kinks in offshore leases to prevent delays on the back end. But ultimately, there is a “chicken and egg problem,” said Will Waskes, BOEM’s North Carolina coordinator. All the federal government can do is facilitate permitting; the financing for the projects is ultimately up to the private market, aided by any state incentives. Dickerson and other advocates said the state should follow the federal government’s lead, and adopt incentives and even requirements for offshore energy, as Maryland has. Five developers responded to BOEM’s initial “Call for Interest” in the Kitty Hawk Wind Energy Area. But none of the initial five who expressed interest nearly four years ago appeared this week at Nags Head, or at a meeting a day earlier in Raleigh. The three wind developers who did attend this week’s meetings weren’t authorized to speak on the record. But all acknowledged that state policy to support offshore wind could be a key factor in their decision to pursue leases. Katharine Kollins, president of the Southeastern Wind Coalition, said many developers could purchase leases now as “insurance,” betting that in five years, either the market or state policy could become more favorable to offshore wind development. Trends suggest that the cost of offshore wind will decline. Onshore wind costs have plummeted in recent years, and offshore costs fell for the first time last year. In any case, wind developers must make clear by October 17, when the federal government closes its public comment period for the Kitty Hawk offshore wind area, whether they want to pursue leases for potentially hundreds of wind turbines off the Outer Banks. Proponents say they hope developers take advantage of an abundant free resource, just as the Wright brothers did so many years ago. “We can get behind wind and wind energy,” Brown of the Outer Banks Chamber of Commerce said. “Using what God gave us, with the big blue out there,” she said, pointing to the ocean from Jennette’s Pier.